Now that Dry January is coming to an end, it's time to join us for Fit February! 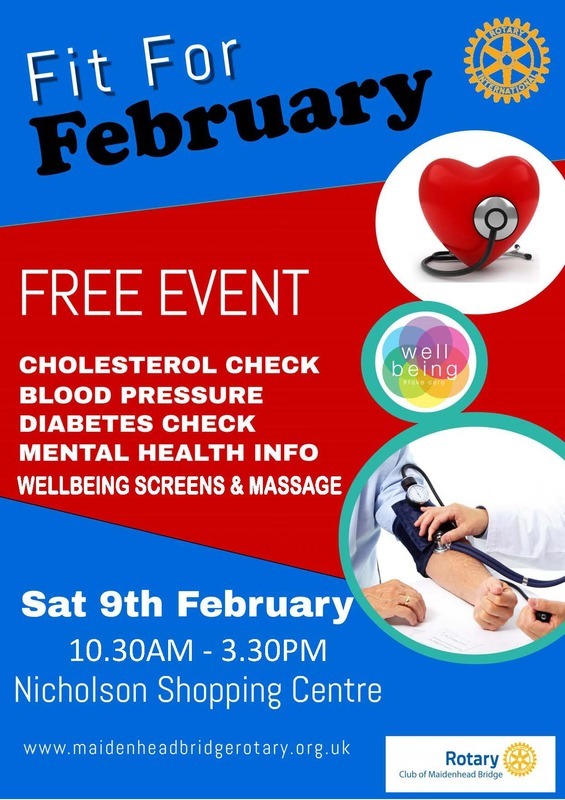 The Rotary Club of Maidenhead Bridge is helping the community of Maidenhead to make 2019 a healthy year with a free, informal Health Awareness Day in the Nicholson Centre on Saturday 9th February between 10.30am – 3.30pm. The Rotary Club will be taking over a unit within the Nicholson Centre from 10.30am to offer advice and information on getting fit, eating healthily, the effects of high cholesterol and how to manage it, diabetes, the risks of high blood pressure, testicular cancer awareness and good mental health practices. ​FREE & confidential health advice.